Other ingredients: dibasic calcium phosphate, stearic acid, modified cellulose gum, and colloidal silicon dioxide. Suitable for vegetarians. 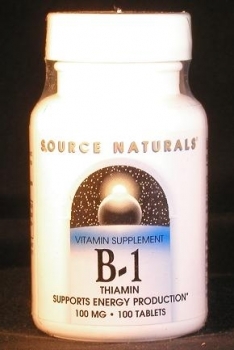 Vitamin-B-1 (thiamin) — If you are dieting or eat irregularly, you should be supplementing with this vitamin. Severe B-1 deficiencies, which occur mainly in alcoholics and people on bizarre diets, result in a potentially fatal condition called ‘beriberi’. Lesser deficiencies, which can be caused by pregnancy, hyperthyroidism, regular strenuous exercise, and other stresses, are associated with generalized muscle weakness and mental confusion. Vitamin B-1 is involved in the release of acetylcholine, a neurotransmitter, from nerve cells, and plays an important role in maintaining the health of the nervous system and heart muscle.